We can compare different integers by looking at their positions on the number line. 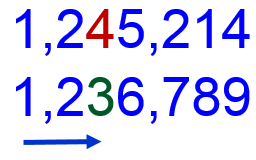 For any two different places on the number line, the integer on the right is greater than the integer on the left. When we compare whole numbers we line up place values (so that similar place values are lined up). Start at the left and find the first place where the digits differ. Example: To compare the numbers 1,245,214 and 1,236,789, we will line up the numbers so the digits in the ones place line up.